This is what happens when a business machine gets out of work, takes its specs off and loosens its tie. Maybe. A decent all-rounder, but please, Lenovo: swap those Fn and Ctrl keys, and give the trackpad more room! Lenovo isn't a household name when it comes to computers, but in business circles the company is well respected for its robust line of ThinkPad laptops (previously produced for IBM). Consequently, you won't find Ubuntu or Mandriva on its IdeaPad netbooks – the only option is SUSE Linux Enterprise Desktop. Lenovo shipped our review IdeaPad S10e with Windows XP, but thankfully there was some quality Splashtop action to show the world how much Linux rocks, and straight away we installed Ubuntu Netbook Remix. From a visual standpoint, the IdeaPad S10e looks exactly like a normal, boxy business laptop that's been zapped with a shrinking ray. That's not to say it looks bad – far from it. But it doesn't have the curves and bends of the others on test here, and looks very serious from the off. We're not convinced about the usability aspects though. The keyboard is decently sized with full cursor keys, but it's quite rattly and the right-hand Shift key is the same size as the other keys, which isn't pleasant to work with (especially after the monster key on the Aspire One A110 and MSI Wind U100). Also, the Fn key is at the far bottom-left of the keyboard, where you'd normally expect Ctrl to be. It wouldn't be hard to swap the Ctrl and Fn keys around to provide a more familiar keyboard layout, as is the case on most of the others that have this problem. Then there's the trackpad: it's tiny. Really, really tiny. The buttons are crisp but very loud too. These aren't total usability calamities, but they do detract from what is otherwise a mostly well constructed machine, albeit with a slightly flexible glossy screen. 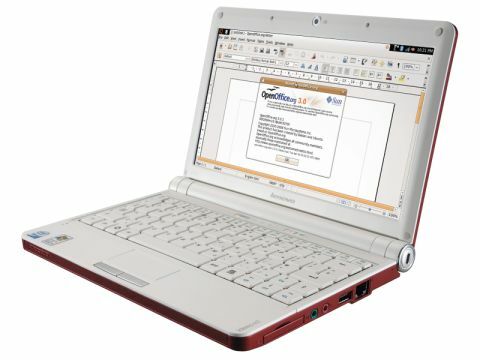 The IdeaPad is one of the only netbooks that includes an ExpressCard slot. This is on the right-hand side, along with headphone/microphone jacks, a USB port, an Ethernet socket and a Kensington lock (built neatly into the hinge). The left-hand side sports a reassuringly large air intake, plus VGA output, an SD card slot and a USB port. We're glad that the ventilation is so accommodating – the machine gets quite hot to the touch underneath when the CPU is heavily loaded. Lenovo supplied us with the six-cell battery (£50–60) for our testing, which adds a tubular bump along the rear of the machine; imagine a couple of packs of Polos put end-to-end and you get the idea. The results in our benchmarks were impressive though: the battery lasted four hours and 16 minutes in our intensive test. For light usage in spates throughout a working day, you won't need to carry a charger with you. Software-wise, Ubuntu Netbook Remix runs excellently, and the 160GB hard drive is a snappy performer compared with some of the sluggish SSDs we've seen. The speakers deliver good bass and point towards you from the front side of the unit's base. Overall, the Lenovo is a good machine, but there are a few usability niggles which could get on your wick.